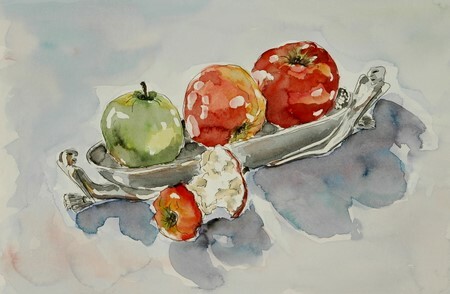 Voila my painting of the week – a bowl with fruit. It took 3 apples to get to the “right” half eaten one. The first one was so crunchy and sweet and just too delicious, I ate the whole thing. That made me full. I then asked Hartman to eat the second one with specific orders…he just gave 3 huge gulps and only the stem was left…a little bit of deliberation there. There was only one left, so I had to eat the third apple carefully, measuring it against the other three after each bite. And then we went to play tennis. When I got back, the apple turned all brown. I had no apples left. So I played guessing game on the color. I love expressionism. I find I can achieve that in oil, a little more challenging in watercolor though. I have a fear of losing the transparency of watercolor….but I think this one isn’t that far off? Oh, this is marvelous! Definitely you’ve kept the transparency. Gorgeous lights and luscious shadows and a very lovely palette – I like the one green apple, really adds a punch to the trio in the dish. The dish. . . just gorgeous, it absolutely looks like pewter!! Oh goodness this one is lovely…such a great wc…. I love what you do with watercolour paint! This is a lovely composition (great bowl!) and the colours simply sing from the page. I like the loose shadow and background, and the way you’ve got the detail of the eaten apple. It’s just so funny that the pair of you nearly ate the still life before you could paint it! Just fabulous! So lovely and loose and those lights just make it zing! Wow, these are wonderful! The colors, reflections and the compostion. I laughed when I read your dilemna of eating all the apples and no wonder, they look so good. i like this one a lot too… the colors, the reflections and the shadows.. great work! Ronell — you have such an easy going, painterly gorgeous style — I LOVE IT — and these fruits are delicious looking and spectacular! What beautiful colors, reflections…the apples look so juicy! lovely! What a lovely little painting. Those highlights just sparkle. Ronell, this is just beautiful! i do love this work!!!! greetings. Thought I’d come out of the woodwork. I love this piece and the great story behind it also. Great blog here, I visit often. Thanks for visiting mine and for the nice comment on my. GREAT piece! It’s just too bad that you had to go through all that trauma of eating apples to get to this point, but we must suffer at times for our work, mustn’t we?! 😉 The colors are marvellous — very transparent and with juicy brushstrokes. This is a keeper! Thank you for taking the time to look and comment…I appreciate it! Ronell, I’m so far behind! My preview button kept showing the same old post – now I know notto trust it! Lovely job on this, it really just glows. This is the effect I keep trying to get – and you do it so effortlessly. Luscious, loose and very much back to your old form I see. Just gorgeous! I’ve missed a whole lot of posts too! Sacrificing the body, or in this case the stomach, for your art. Well done! “It took 3 apples to get to the ‘right’ half eaten one” — Shucks, Ronell, I think I need to start drawing something that I can eat too. Hmm … should I start with subject like a half eaten cake? I wonder how many pieces I need to eat before I get the perfect half eaten look. (Sigh) Things that we must do for art’s sake!“Have to guess the colors.” Wow, they look really good, Ronell! Those apples, and the perfectly half eaten one, look so luscious and delicious!